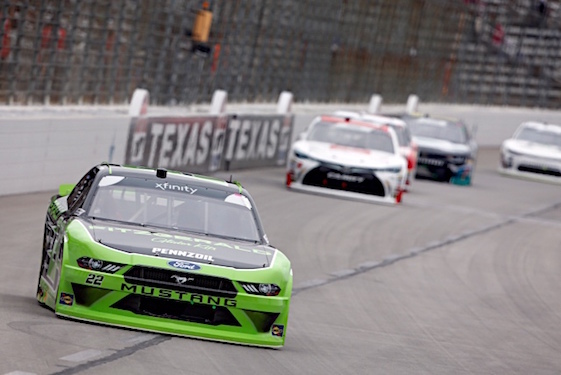 FORT WORTH, Texas – Pole-winner Ryan Blaney extended the growing legacy of Team Penske’s No. 22 Ford team Saturday afternoon, dominating the field en route to victory in the 22nd annual My Bariatrics Solutions 300 at Texas Motor Speedway. Blaney handed the team led by crew chief Brian Wilson its third consecutive NASCAR Xfinity Series victory after 200-laps/300-miles around TMS’ 1.5-mile oval. Blaney, driver of the No. 22 Mustang, finished 2.327-seconds ahead of Christopher Bell and his No. 20 Toyota Camry. Blaney, a regular in the Monster Energy NASCAR Cup Series for car-owner Roger Penske, scored his seventh Xfinity victory and first at TMS after claiming his second pole in 66 series starts Saturday morning. The No. 22 Ford had won the last two consecutive races at ISM Raceway in Avondale, Ariz., with Brad Keselowski and Auto Club Speedway in Fontana, Calif., with Joey Logano to take the owner standings lead over JR Motorsports’ No. 1 Chevrolet Camaro team and driver Elliott Sadler. Blaney said there certainly was pressure to keep the win streak going. “Oh, yeah. I am not gonna lie about that,” said Blaney, who had logged three runnerup finishes in his first five Xfinity starts here. “Brad and Joey, they definitely reminded me of that this week. They told me that they won in that thing, that it has won two in a row and not to mess it up. They were definitely reminding me of that. And it is in the back of your mind. Meanwhile, second through fifth-place finishers Bell, Daniel Hemric, Cole Custer and Ryan Preece qualified for the opening round of the 2018 NASCAR Xfinity Series Dash 4 Cash program at Bristol Motor Speedway next weekend. As a Cup regular, Blaney is ineligible for the $100,000 bonus program. Blaney led three times for a race-high 132 laps, almost 100 more than Hemric’s 39 laps-led. Blaney was replaced at the point for the first time on a restart on Lap 76, when he spun his Goodyear tires and Bell bolted into the lead. Ambient temperature at the drop of the green flag shortly after 2 p.m. (CDT) was 34 degrees. According to the track’s unofficial records, the previous coldest race here was the O’Reilly 300 Xfinity Series event run on April 14, 2007, when the temp was an “unseasonable” 47 degrees. That event was won by Matt Kenseth in the No. 17 Ford over Denny Hamlin and his No. 20 Chevrolet by 0.128-seconds _ still the closest XFINITY Series result in TMS history. Wilson never panicked, especially during the 45-lap Stage 1 that produced three cautions in the first 17 laps. “Like Ryan said, the big question coming into the day was how the car would respond to the track temp being so much cooler,” Wilson said. “You never know what you are going to have when it’s that big of a swing. “Really, the beginning of the race being out front it was great to see but I wanted to see how we were if we got back in traffic and had to fight through anything because clean air helps so many things. We kind of got jumbled up there and the reason we were at all was just the way the stage racing goes where everything kind of got cycled-out and some guys had pitted and finally we pitted and guys stayed out for the stage breaks. Bell, the 2017 NASCAR Camping World Truck Series champion for Kyle Busch Motorsports, wound up leading 10 laps en route to his second top-10 finish in two Xfinity Series races at TMS. Blaney took the lead for the final time from Michael Annett and his No. 5 Camaro on Lap 154 and continued to extend his advantage while averaging 124.986 mph. Since the series’ inception in 1982, a single car/team has only won three or more consecutive races 13 times. The last time a team in the Xfinity Series won three races in a row was 2016, when Kyle Busch _ the series’ winningest driver _ won at Kentucky, New Hampshire and Indianapolis in the Joe Gibbs Racing No. 18 Toyota. Team Penske, however, is no stranger to stringing wins together. The No. 22 Ford guys won three straight in 2013 with Keselowski earning victories at Iowa and Watkins Glen and AJ Allmendinger winning at Mid-Ohio. The Dash 4 Cash program provides four drivers with the opportunity to compete for an additional $100,000 prize at select races. Fulltime Xfinity Series drivers will compete for four positions in consecutive Dash 4 Cash events at Bristol Motor Speedway (April 14), Richmond Raceway (April 21), Talladega Superspeedway (April 28) and Dover International Speedway (May 5). The top four Xfinity Series drivers at TMS qualified for the first Dash 4 Cash event at BMS. Of the four competing for Dash 4 Cash, the highest finisher wins a $100,000 prize. That winner and the three highest-finishing fulltime Xfinity Series drivers, for a total of four contenders, will qualify for the next week’s event. Hemric, driver of the No. 21 South Point Hotel & Casino Camaro, will head into the Dash 4 Cash after posting his first top-10 result in three races at TMS. Series point-leader Sadler, driver of the No. 1 OneMain Financial Camaro, finished eighth and exited Texas with an 11-point lead in the championship over Tyler Reddick and his No. 9 BurgerFi Camaro. Meanwhile, 76-year-old Morgan Shepherd’s landmark 1,000th NASCAR national series start saw him complete just 33 laps in his No. 89 Visone RV Camaro before retiring with a suspension problem. Shepherd finished 38th in the 40-car field.